The destin wave runner operators can check you out in the operation of wave runners, and have you riding off on your own wave runner in minutes. You have a short course that is usually a video, and you can ride off on your wave runner. The destin wave runner rental operators are listed below. Wave runners in Destin Harbor. This Lady knows the rules. The harbor is a "No Wake" Zone, and only idle speed is permitted until you are out of the harbor. See the listing to the left of the photo for Destin Jet Ski operators. Gilligans Watersports also offers a neat dolphin cruise on waverunners. You can get up close to the dolphins in an experience unmatched in the Destin area. While operating waverunners is not difficult a short training film is required to be viewed before you can strike out on your own. 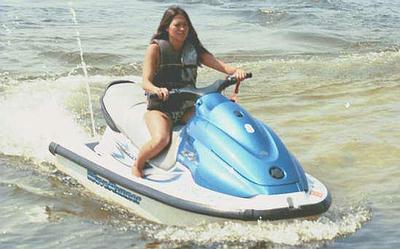 The same or similar training is required by all waverunner operators.